Changes to flight paths at Mineta San Jose Airport will allow taller buildings downtown and around Diridon Station. Photo by Sergio Ruiz for SPUR. For years, people have asked why San Jose’s skyline is so … diminutive. This month, the city made a big decision that will finally allow its downtown to grow upward: Changing flight paths at Mineta San Jose Airport will allow taller buildings — without compromising safety or impinging on the airport's growth. One of San Jose’s greatest assets is the proximity between Mineta San Jose International Airport and the greater downtown district, including Diridon Station. Getting to and from the airport easily is a convenience many cities would love to have. While a tremendous asset, this close proximity to downtown has limited how tall buildings can be both downtown and in the area around Diridon Station. Seeing the opportunity to both strengthen the local airport and increase density within these two very important districts, SPUR started a discussion to examine the tension between downtown airspace and development capacity: Did the two really have to be at odds? In early 2018, SPUR published an article that examined the current height restrictions within these two districts and how increased density would allow the city to maximize the amount of jobs and housing near transit. 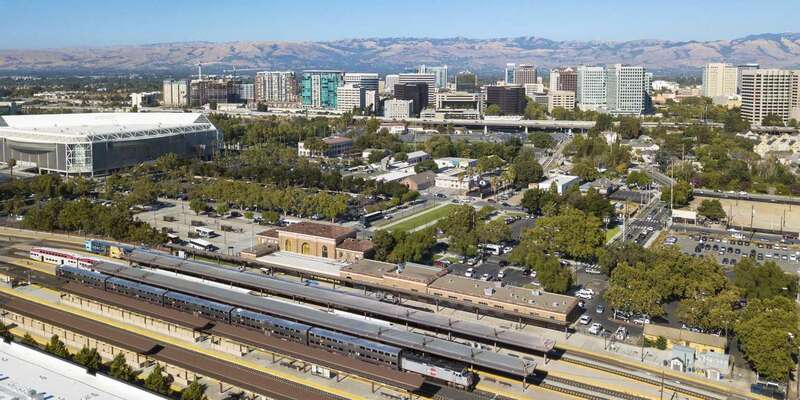 To consider the issue, the City of San Jose developed a cross-sector committee of business, labor and civic organizations, including SPUR, to examine downtown airspace and development capacity. With the technical support of the city's aviation consultant, Landrum and Brown, the committee evaluated several possible scenarios that would allow for increased development in downtown with the least negative impact on airport operations. What we learned is that by changing some procedures that airlines follow for economic — but not safety — reasons, flight paths could be altered and development downtown and in the Diridon Station Area could be taller, helping San Jose to increase its commercial and residential growth and achieve its goals for community development, as laid out in Envision San Jose 2040, the city’s general plan. After more than a year of intensive research, coordination with airlines and consideration on how to maximize community benefit, the committee recommended a scenario that would allow buildings to be 5 to 35 feet taller in the downtown core and anywhere from 70 to 150 feet taller around Diridon Station. SPUR supported the recommended scenario, and the San Jose City Council approved it on March 12. This will allow an additional 8.6 million square feet of development in the Diridon Station Area, resulting in net new construction value of $4.4 billion — and as much as $5.5 million in net new annual property tax revenue to the city (once all 8.6 million square feet is completed). What does this mean for San Jose, and why is it important to allow taller buildings in these two areas? Maximizing the amount of jobs and housing within walking distance of Diridon Station will connect lots of residents and workers to high-quality transit and help to alleviate the congestion of workers flowing north by creating a regional job center for the South Bay. With $10 billion of public investment going to connect BART, Caltrain, high-speed rail and VTA light rail at Diridon, we must ensure that these services have the ridership needed to support them. Perhaps more importantly, maximizing development will generate more fees to support the creation of thousands of affordable housing units, as well as community amenities, such as parks. As San Jose develops this policy further, we believe the city has the opportunity — and responsibility — to capture the value of these height increases. The incentive for increased square footage should require that new development follow the highest standards of good urban design. Commercial and residential properties should incorporate privately owned public open spaces and ensure access for all of San Jose. New development should use this density bonus to invest deeply in green infrastructure and create a model eco-district that helps further the city’s ambitious and vitally important climate goals. We strongly believe that a healthy and vibrant downtown, along with a well-operated and growing regional airport, will further the success of San Jose. This is San Jose’s opportunity to bring the vision the city set forth in Envision 2040 into action today.